THE advance billing for government bonds in 2014 was that they would be shunned by investors, hopeful for higher returns in equities and fearful of monetary-policy tightening as America’s central bank started to phase out its bond-purchasing programme. That may still turn out to be the case, especially if the recovery flourishes. But the first reel of the show has not conformed with those expectations. Bond markets have fared surprisingly well. Instead of rising since the end of 2013, yields on benchmark ten-year bonds, which are inversely related to prices, have fallen in America and Europe (see chart). Yields on US Treasuries have slipped from 3.01% to 2.88%; on British gilts from 3.03% to 2.86%; and on German bunds from 1.94% to 1.83%. Yields on emerging-market sovereign debt have been spared the rise many were fearing. Some bond markets in the once ostracised periphery of the euro area have done particularly well. 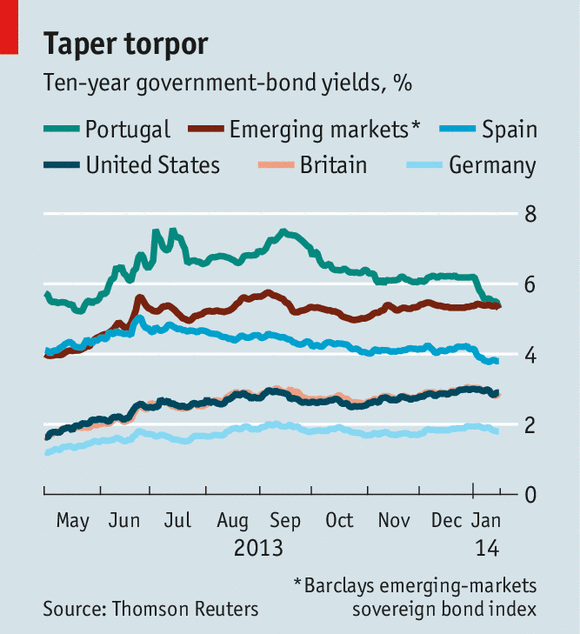 In Portugal, which needed a bail-out programme in mid-2011, yields have dropped from 6.2% at the end of 2013 to 5.3%. This steep fall was helped by a successful sale of five-year debt on January 9th, which raised €3.25 billion ($4.4 billion) in an issue that attracted total orders of over €11 billion. Two days earlier a sale of Irish ten-year bonds was also heavily oversubscribed. The good start reflects factors that are specific to America and to Europe as well as common influences. American bond yields, which set the tone for global markets, had already risen a long way since last summer when the Federal Reserve first mooted “tapering” its $85 billion-a-month asset-purchasing programme. That sent a shock rippling round the world that was felt most of all in emerging markets, where yields surged. The Fed’s failure to start the taper in September, as many observers had expected, brought temporary respite. But after the Fed’s decision on December 18th to lower this month’s purchases to $75 billion, ten-year US bond yields had risen from around 1.6% at the start of May to 3% by the end of 2013. Signs of a burgeoning American recovery underpinned both the rise in yields on US Treasuries and the Fed’s decision last month to start tapering. But disappointing jobs figures released on January 10th punctured the increasingly optimistic mood. Economists had expected employers to add around 200,000 jobs in December; the actual number was a lowly 74,000. The unemployment rate, based on a separate household survey, fell from 7% to 6.7%, but this was largely because of people dropping out of the labour force, which at 62.8% of the adult population has slipped back to where it stood in October, the lowest level since 1978. The poor jobs figures may be an aberration, caused by unusually cold weather last month. But they were enough to prompt traders to wonder whether the Fed might be more cautious than they had imagined in phasing out its asset purchases, let alone in raising interest rates. That unemployment has now fallen close to the 6.5% threshold at which the Fed had previously said it might start raising rates no longer matters. In December it said that it would keep its benchmark rate at its current low “well past the time” the unemployment rate falls below 6.5%. Another reason for a rethink about bond markets is low inflation. In America the price index targeted by the Fed (which aims at 2% inflation) has been rising by less than 1%. In Britain consumer-price figures published on January 14th showed inflation hitting the Bank of England’s 2% target, after four years above it. The fillip to bond markets from low inflation is stronger still in the euro zone, where consumer prices rose by just 0.8% in the year to December and core inflation (stripping out volatile items like energy and food) fell to a record low of 0.7%. An environment where the risk is of deflation rather than inflation is proving a potent incentive for some investors to take a punt on bonds in southern Europe. Dismal sovereign credit ratings will remain a barrier, although these typically lag behind the markets. High government and external debt will continue to deter the more cautious. Nonetheless, Portuguese bond yields, which for most of the past four years have been much higher than those for emerging markets, are now at parity with them. The gains in bond markets have contrasted with a setback in equities in the first half of January. Global stockmarkets have fallen by 0.3%, with America’s S&P 500 taking a particular tumble on January 13th, when it fell by 1.3%. Investors who fear that last year’s spectacular rally went too far may have started to reconsider where to put their money. Plenty could yet go wrong for bond investors this year. Market historians point to 1994, when an unexpected tightening in American monetary policy led to a disastrous surge in yields. But the Fed has put so much weight on its “forward guidance” that such a lurch seems unlikely. If inflation remains low in the developed world and the recovery does not accelerate wildly, 2014 may live up to its benign beginnings for bonds. WASHINGTON, DC – The world is still struggling to digest Alan Greenspan’s mixed legacy as Chairman of the US Federal Reserve Board from 1987 to 2006. So it is too soon to assess whether his departing successor, Ben Bernanke, is headed for history’s chopping block or its pedestal. But the crucial international role that Bernanke and the Fed played during his tenure – a time when domestic economic weakness translated into relatively ineffective American global leadership – should not be overlooked. In these last five crisis-ridden years, the Fed has affected the world economy in two ways: through its hyperactive policy of purchasing long-term assets – so-called quantitative easing (QE) – and through its largely overlooked role in providing international liquidity. Let us consider each. Whatever the impact of QE on the US economy, its impact on the rest of the world has been, on balance, generally benign. The first round of QE was unambiguously beneficial, because it minimized, or even eliminated, the tail risk of a global depression after the collapse of Lehman Brothers in September 2008. To be sure, subsequent action by the Fed received a mixed reception in the rest of the world. In 2010 and 2011, when QE pushed capital to emerging markets, there were complaints that the US was practicing a form of currency manipulation. Since May 2013, when Bernanke signaled the possibility of unwinding QE, emerging economies have faced the opposite type of pressure: capital outflows and sharp currency adjustments. But in both cases, the problems for which blame was heaped on the Fed largely reflected macroeconomic mismanagement in the affected countries. For example, Brazil complained most vocally about capital inflows, because its currency had over-appreciated in a short period of time; but the main culprits were domestic wage increases and overheating, not the Fed’s policies. Likewise, India was severely affected by Bernanke’s suggestion that the Fed would “taper” QE, but only because its economy was characterized by high inflation and large budget and external deficits. It was as if the emerging markets had forgotten that exposure to Fed policies was part of the bargain they willingly made when they signed on to financial globalization. Meanwhile, the Fed has been mindful of its international responsibilities, playing a constructive role by increasing dollar liquidity in times of extreme financial stress. It provided dollar liquidity (via swap lines) to the central banks of Brazil, Mexico, Singapore, and South Korea in the aftermath of the Lehman failure. And it has provided nearly unlimited amounts of similar liquidity to central banks in Europe and the Bank of Japan. These actions contributed to easing extremely tight financial conditions and corresponding market volatility. The Fed’s support to emerging-market central banks was remarkable, because most of these countries chose not to borrow from the International Monetary Fund, which, in the aftermath of the Asian financial crisis in the 1990’s, had come to be considered an instrument of US hegemony. They preferred to deal directly with the United States via the Fed, to which the IMF stigma evidently did not extend. In fact, the speed, timeliness, and effectiveness of Fed support have now led to efforts to institute similar mechanisms at the IMF. The Fed’s support for Europe was similarly remarkable, because the rest of the US government was an ineffective bystander at the time – able to offer cheap counsel but little hard cash to the eurozone’s distressed economies. Even efforts to augment the IMF’s resources floundered on the reef of American political dysfunction. All other major economies, including key US allies, have enacted the legislation needed to strengthen the IMF; in the US, however, there has been no comparable action since 2010, owing to Congressional resistance. The explanation for the Fed’s exceptional role in the context of otherwise anemic American international leadership is simple: though the US economy is weak, and American politics is polarized to the point of paralysis, the dollar is still in demand. In these circumstances, Bernanke effectively leveraged his role as controller of the mighty dollar-printing machine known as the US Federal Reserve. Dollar supremacy will not last forever, and it is increasingly being challenged by the Chinese renminbi, as I describe in my book Eclipse: Living in the Shadow of China’s Economic Dominance. But that vestigial source of American supremacy made Bernanke a constructive and effective international leader. As he departs from office, the assessment of his performance as “Helicopter Ben,” who dropped piles of cash on the US economy, will begin in earnest. But history should not neglect “Ambassador Ben’s” crucial global role. Arvind Subramanian is Senior Fellow at the Peterson Institute for International Economics and the Center for Global Development. For years, getting a job at a Wall Street bank, a Magic Circle law firm or a blue-chip management consultancy was a route to a very rewarding career in return for an awful lot of work. 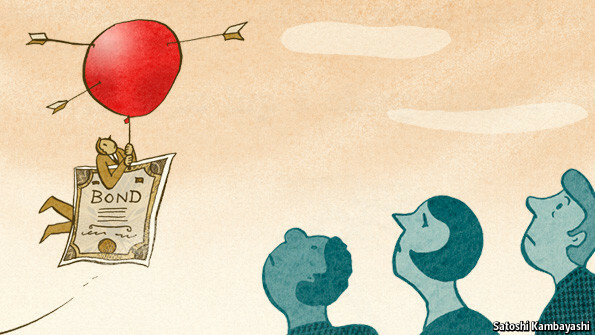 Lately, the bargain has lost some of its appeal to the best and the brightest. The death last year of Moritz Erhardt, a German student who was interning at Bank of America in London, was one prompt for a rethink among investment banks about how they treat young employees. So too, is growing competition for talent from technology companies that offer equity, informality and less relentless work demands. Both Bank of America and Credit Suisse have announced measures to curb the tradition of making young bankers work into the early hours and through weekends on spreadsheets and pitch books. Law firms are trying to curb attempts by juniors to shine by billing incredible numbers of hours. Consulting firms are telling partners to show a little respect for their juniors. There is no simple fix for an entrenched culture of overwork at professional services firms. The fact that an entry-level analyst at a Wall Street bank is required to sacrifice his or her personal life to the job – sitting at a desk until dawn, eating order-in food and correcting invisible errors in spreadsheets – has been built into the system. “They know they have signed up for long hours but, until they get there, they don’t realise how disruptive it is. Your friendships deteriorate and your boyfriend or girlfriend is angry because they have not had a meal with you for a month. You lose touch with your family. It’s miserable,” says Kevin Roose, the author of Young Money , a forthcoming book on Wall Street’s first- and second-year recruits. It is, of course, an elite problem. Despite everything, thousands compete for such jobs, hoping the Faustian pact will pay off. Goldman Sachs, which has tried to reform how it treats junior employees, received 17,000 applications for its 2014 intake of analysts and recruited 330. In some ways, those jobs have become more attractive as other industries have reduced recruitment of young people, instead taking on unpaid interns who must work for nothing, relying on parental subsidies. The deal-related professions not only pay well but train their recruits. There is, however, a flaw in the all-or-nothing choice. The imposition of long hours on analysts and associates is not simply a rite of passage, a military-style effort to destroy resistance and inculcate loyalty to the organisation. It is a symptom of a problem with work in professional services in the 21st century – it is unhealthy. Erhardt’s death may have been an extreme example – the cause was an epileptic fit that a coroner said could have been triggered by overwork. But many bankers, lawyers and consultants face the stress of not being able to set any boundary between work and home. It ripples down the chain of command, starting from the top. For a generation, occupational psychologists have viewed the most stressful kind of work as that with high demands and no autonomy: for example, a factory worker who has to follow a strict routine but is given little time to do it. Such employees face higher risks of heart disease and stress-related illness. Professional services jobs are not like that – consultants and lawyers have a lot of autonomy and tend to work independently. The difficulty is that clients pay large amounts of money to firms for deal-related advice – often running into millions of dollars. In return, they expect high levels of service delivered seamlessly and without delay. This has always involved working on deals late or on weekends. But technology and globalisation have now lowered the barriers to working around the clock routinely. A banker or consultant is always available to be pulled into a conference call in any timezone. “It is not enough for your health to limit your work stress. You also need to control your time strain,” says Professor Phyllis Moen at the University of Minnesota. The easiest way for senior bankers or lawyers to do that is by handing out-of-hours work over to juniors and disrupting their lives instead. Many junior bankers end up working in the evening because a partner who has been out pitching to potential clients all day returns to the bank late in the afternoon, and tells them to prepare a document immediately based on the sortie. Although they have been at their desks for hours, they start to work intensively only then. The good news is that this method of organising work is inefficient and thus ripe for reform. The bad news is that many lawyers or bankers do not care much about that. Not only do they feel, like senior doctors, that they too were juniors once and this generation deserves to suffer equally, but the status quo is easier for them. BCG has instituted a policy of giving its employees predictable times off – an evening or a day at the weekend when they will not be contacted and they can switch off the phone. It hardly sounds like a revolution to place some border between work and home but, for many firms, it is.